The originally studied beltline was for a highway to bypass the city on the east side to connect Interstate 74 with Illinois Route 1 north of Danville. The proposed beltline route, to run parallel to Bowman Avenue but farther east, ran from West Newell Road, hooking south on Bowman Avenue, going east on Poland Road and then turning south through farm fields, east of the railroad tracks east of the airport, stretching south between Daisy Lane and Brewer Road and hooking up with Interstate 74 and Perrysville Road. The Federal Highway Administration approved construction of a new Interstate 74 interchange between the Bowman and Lynch Road exits years ago. Some residents have voiced concerns in the past about the beltline’s need and the potential to hurt existing businesses, the impacts on their properties and increased noise and traffic. It’s possible that U.S. Route 136 (US-136) and/or Illinois Route 1 (IL-1) could be realigned from their current routing in Danville to the new beltline, or, more likely, to a more feasible reconstruction of Bowman Avenue that would involve the construction of overpasses over railroads along the route. If IL-1 is rerouted to Bowman Avenue, it’s not clear how such an alignment of IL-1 would connect to the current IL-1 alignments leading to places like Rossville and Hoopeston to the north and Westville and Georgetown to the south. Another, even less likely, possibility is that part of the proposed beltline connecting to, and north of, Interstate 74 would be built to Interstate Highway standards and become part of an eastern extension of Interstate 72 running from its intersection with Interstate 57 in Champaign, Illinois to Toledo, Ohio via Lafayette, Indiana and Fort Wayne, Indiana. Danville doesn’t really have a high enough population nowadays to support another suburban-type development like what already exists along North Vermilion Street in the northern part of the city or along Lynch Road near the Indiana border. As a result, I don’t think there would be a ton of traffic along the proposed Danville beltline, meaning there probably will not be a lot of economic development opportunity. The proposed Danville beltline could end up being a road to nowhere. I hope that any new federal infrastructure legislation goes primarily towards rebuilding existing bridges that are crumbling and/or obsolete, not gaudy new highway developments or, even worse, private infrastructure like oil pipelines. While many people are trying to paint next year’s race for Milwaukee County (WI) Executive as a two-way race between conservative incumbent Chris “Boss” Abele and Wisconsin State Senator Chris Larson, I’m not endorsing either of those candidates. Instead, I’m endorsing Joseph Thomas Klein, who is also running for Milwaukee County Executive. You may remember Klein from his failed Pirate Party bid in the 19th Assembly District of Wisconsin last year. Now, Klein is running in an officially non-partisan race in a bid to become the chief executive of Wisconsin’s most populous county. I’m not sure if he was an ancestor of the Joseph Klein who is currently running for Milwaukee County Executive, but an individual named Joseph Klein (not the same Joseph Klein who is running for Milwaukee County Executive today) was a Socialist member of the Wisconsin State Assembly for one term from 1919 to 1921. The other candidate in the county executive election is Joseph Thomas Klein, the Wisconsin Pirate Party organizer. His position on the Go Pass program? I love the idea of using parking fares to fund public transit! If elected Milwaukee County Executive, Joseph Klein will bring fresh, common-sense ideas to Milwaukee County. The same can’t be said for Abele and Larson, both of whom serve political power brokers and their own egos. As county executive, Abele has repeatedly attacked organized labor, progressives, and anyone else who disagrees with him, and he’s one of Scott Walker’s biggest allies. Among the things that Abele has done in office have included pushing to gut the Milwaukee public school system, pushing to prohibit Wisconsin counties from enacting living wage ordinances, defending money in politics, and being worse than Scott Walker on labor issues. Larson, on the other hand, is best-known for handing Republican Howard Marklein a seat in the Wisconsin State Senate (17th Senate District, 2014 election) by backing establishment lackey Pat Bomhack over progressive patriot Ernie Wittwer in the Democratic primary. Should more than two candidates make the ballot, the non-partisan primary for Milwaukee County Executive would be held in February of next year, and the two highest vote-getters would move on to the general election. The general election for Milwaukee County Executive, also officially non-partisan, will be held in April of next year. He cited figures for the state’s budget deficit. “I wrote this stuff all down but I don’t need it because I have a really good memory,” he said. He also accused Mr. Walker of flip-flopping on the Common Core education standards, having once supported them. “Scott Walker changed when he saw he was getting creamed, so now he’s not in favor,’’ he said. While I am a Bernie Sanders supporter, I disagree with Bernie’s support for Common Core; in fact, it’s one of only a few issues where I disagree with Bernie. I don’t like the idea of wealthy people like Bill Gates determining every state and school district’s curriculum and academic standards. Anyways, back to the main subject of this blog post…while Trump is a blowhard and a half, he’s right when it comes to how awful Scott Walker’s far-right agenda has been for Wisconsin. However, trying to find Democrats in Wisconsin who are even half as effective as Trump when it comes to attacking Walker is like trying to find a tennis racket at a golf pro shop. Most Democrats in Wisconsin tend to focus on only a few issues like reproductive rights and student loan reform, and they usually try to sound as nice and moderate as possible. When most Wisconsin Democrats criticize Walker, they usually come across as weak, tepid, defensive, too mild-mannered, and appeasing toward Republicans. There are a few exceptions to this, mostly Democratic/progressive elected officials from the Madison area and many progressive activists throughout Wisconsin. Additionally, Trump’s far-right agenda isn’t much different, if any different at all, than Walker’s far-right agenda or the far-right agendas of the other Republican presidential candidates. For Trump to enact his political agenda nationwide would likely be as bad, if not worse, than Walker’s agenda has been for Wisconsin. Also, regarding Trump’s remarks about roads in Wisconsin being terrible, he’s actually right…only Connecticut and Illinois have a higher percentage of roads in poor or mediocre condition than Wisconsin. Walker may not be a member of the 1%, but his policies benefit the 1% and virtually nobody else. Electing Trump, Walker, or any other right-wing Republican to the White House would be an unmitigated disaster for this country…Wisconsin has basically been a lavatory (pun intended) for a far-right political agenda for the last four and a half years, and it’s been an absolute disaster there. Chris “Capper” Liebenthal has an excellent post about Trump’s attacks against Walker here. AUTHOR’S NOTE: The following article includes a French translation, courtesy of Google Translate. I have no actual working knowledge of the French language. Below the first page break is the English-language article, and below the second page break is the French-language translation. NOTE DE L’AUTEUR: L’article suivant contient une traduction en français, gracieuseté de Google Translate. Je ne connais pas de travail effectif de la langue française. Ci-dessous le premier saut de page est l’article de langue anglaise, et en dessous de la deuxième saut de page est la traduction en langue française. Two years and three days ago, a train carrying crude oil from the Bakken rock formation along the border between the United States and Canada in the northern Great Plains derailed in the town of Lac-Mégantic, Quebec, Canada, causing explosions of oil tank cars that destroyed dozens of buildings in the central part of Lac-Mégantic and killed 47 people. The train that derailed in Lac-Mégantic passed through Milwaukee, the largest city in the American state of Wisconsin, where a railroad bridge responsible for carrying trains loaded with oil tank cars has deteriorated so badly, some of the beams supported the place have been rusted hollow. Earlier this week, a protest was held at the bridge, which runs right next to lofts in the Fifth Ward area of Milwaukee that would likely be destroyed in the event that an oil train derails and explodes, whether it occurs because of the bridge collapsing or for some other reason. Protesters were critical of both the deteriorating condition of the bridge and the oil trains that use it frequently, and they called for the release of bridge inspection reports and for the development of an evacuation plan in the event that either an oil train or other type of train carrying hazardous materials were to derail. The deteriorating railroad bridge in Milwaukee is owned by Canadian Pacific Railway, a company, which is based in Calgary, Alberta, Canada, that runs freight trains through the United States and Canada. Under United States federal law, Canadian Pacific is legally responsible for inspecting the bridge and maintaining inspection reports. However, because the bridge has rusted and deteriorated so badly, a proper inspection of the bridge is impossible, according to a steel engineer that WITI-TV, a local television station in Milwaukee, brought to the bridge with them. Despite requests from WITI, Canadian Pacific has repeatedly refused to make the bridge inspection reports available to them. Additionally, the United States Federal Railroad Administration, the only government entity in the United States that can demand the release of bridge audits from Canadian Pacific, has claimed to have never asked for the Milwaukee bridge inspection reports from Canadian Pacific. Because of deteriorating railroad infrastructure and more trains carrying tank cars full of highly-explosive oil across America, places like Milwaukee could become the next Lac-Mégantic if action isn’t taken to fix our crumbling infrastructure and increase the amount of energy being generated from renewable sources like solar and wind. Il ya deux ans et trois jours, un train transportant du pétrole brut de la formation rocheuse Bakken long de la frontière entre les États-Unis et au Canada dans les Grandes Plaines du Nord a déraillé dans la ville de Lac-Mégantic, Québec, Canada, provoquant des explosions de wagons-citernes de pétrole qui a détruit des dizaines de bâtiments dans la partie centrale de Lac-Mégantic et tué 47 (quarante-sept) personnes. Le train qui a déraillé à Lac-Mégantic passé par Milwaukee, la plus grande ville dans l’état américain du Wisconsin, où un pont responsable de l’exécution des trains chargés de wagons-citernes d’huile de chemin de fer a tellement détériorée, quelques-unes des poutres supportées l’endroit ont été rouillé creux. Plus tôt cette semaine, une manifestation a eu lieu sur le pont, qui passe juste à côté de lofts dans la cinquième zone de pupille de Milwaukee qui serait susceptible d’être détruite dans le cas où un train d’huile déraille et explose, si elle se produit en raison du pont effondrement ou pour une autre raison. Les manifestants ont critiqué à la fois l’état de détérioration du pont et les trains de pétrole qui l’utilisent fréquemment, et ils ont appelé à la publication des rapports d’inspection des ponts et pour l’élaboration d’un plan d’évacuation dans le cas où soit un train de pétrole ou autre type de train transportant des matières dangereuses étaient à dérailler. Le pont de chemin de fer détérioration de Milwaukee est possédée par Chemin de fer Canadien Pacifique, une société, qui est basée à Calgary, Alberta, Canada, qui gère les trains de marchandises à travers les États-Unis et au Canada. États-Unis en vertu de la loi fédérale, le Canadien Pacifique est légalement responsable pour inspecter le pont et le maintien de rapports d’inspection. Cependant, parce que le pont a rouillé et tellement détériorée, une bonne inspection du pont est impossible, selon un ingénieur en acier qui WITI-TV, une station de télévision locale à Milwaukee, a apporté sur le pont avec eux. Malgré les demandes des WITI, le Canadien Pacifique a refusé à plusieurs reprises que les rapports d’inspection des ponts à leur disposition. En outre, les Etats-Unis la l’administration des chemins de fer fédéraux, la seule entité du gouvernement des États-Unis qui peuvent exiger la libération des audits de pont du Canadien Pacifique, a affirmé avoir jamais demandé les rapports d’inspection des ponts Milwaukee de Canadien Pacifique. En raison de la détérioration des infrastructures de chemin de fer et plus de trains transportant des wagons-citernes plein d’huile hautement explosive à travers l’Amérique, des endroits comme Milwaukee pourraient devenir la prochaine Lac-Mégantic si des mesures ne sont pas prises pour corriger notre infrastructure en ruine et d’augmenter la quantité d’énergie produite à partir de de sources renouvelables comme l’énergie solaire et éolienne. The Republican-controlled Wisconsin state government has floated yet another ridiculously bad idea…a $25 fee on new bicycles, or, as I like to call it, the Mary Burke Tax. Burke is a former Trek Bicycles executive who ran a horrible campaign for Governor of Wisconsin in 2014, losing to Republican incumbent Scott Walker. This proposal, along with the repeal of the Wisconsin Complete Streets law, which requires bicycle and pedestrian uses to be factored into transportation projects in Wisconsin, is part of a political war on cycling in Wisconsin. More than anything else, this is clearly the Republicans’ way of getting political payback at Burke for running against Walker. After all, the Republicans usually don’t support anything that could even be remotely interpreted as raising taxes….except, of course, if the new tax or tax increase primarily affects Democrats, liberals, progressives, environmentally-conscious people, women, minorities, businesses they don’t like, and/or the poor. While I’ve not seen Republicans in Wisconsin use this talking point, at least one Republican in the State of Washington tried to claim that, because people breathe out carbon dioxide, bicyclists cause more pollution than people using other forms of transportation, while trying to defend a proposed bicycle tax in Washington state. That’s a false argument, since it doesn’t factor in the fact that plants breathe in carbon dioxide as part of the carbon cycle. While I’ve not been on a bicycle since I was five or six years old, and I’m too clumsy to ride a bicycle because I have Asperger’s syndrome, waging a political war on cycling will lead to more pollution and more traffic crashes involving bicyclists, something that Wisconsin, Washington state, and the rest of this country simply can’t afford. Should state governments need to fill transportation budget deficits, I recommend enacting taxes on automobiles that get very poor gas mileage and taxes on gasoline-powered automobiles (i.e., automobiles that are not electric or hybrid) worth more than $50,000, if a particular state doesn’t already collect such taxes. 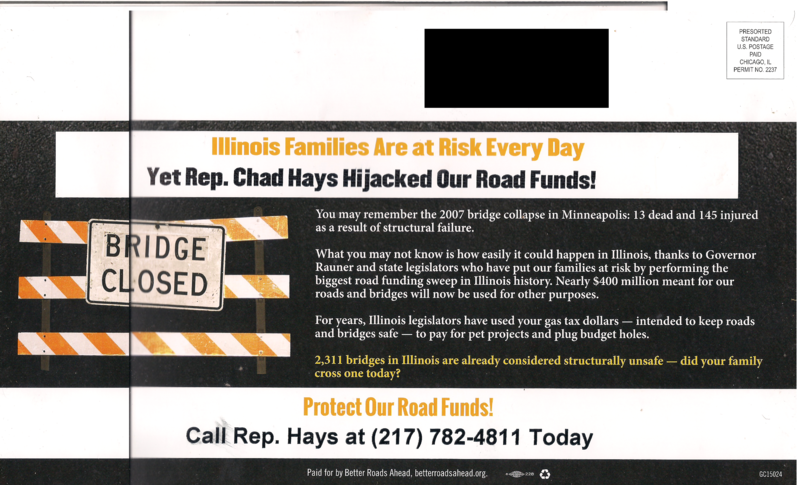 AUTHOR’S NOTE: The author of this blog post has no intention whatsoever of running against Republican Illinois State Representative Chad Hays and is not in any way affiliated with Better Roads Ahead. My governor and state representative, Gov. Bruce Rauner (R-IL) and State Rep. Chad Hays (R-Catlin, IL), helped raid hundreds of millions of dollars from funds collected from state gasoline taxes, which are supposed to be used to pay for road construction and maintenance. In typical Illinois fashion, Rauner, Hays, and their ilk decided to use the money for other purposes. To give readers of this blog post a general idea of how terrible the condition of our nation’s infrastructure is, I strongly recommend reading and viewing this 60 Minutes feature about our nation’s crumbling infrastructure. You’d be absolutely shocked at how terrible the condition of our nation’s roads, railroads, and bridges are. I find it highly disgusting that Rauner, Hays, and their ilk would use taxpayer money collected from state gasoline taxes, which are supposed to be used to fund road construction and maintenance here in Illinois, and use the money for other purposes. I would only support raiding transportation funds and using them for other purposes if our state’s politicians literally had no other option available to them to balance the state budget. 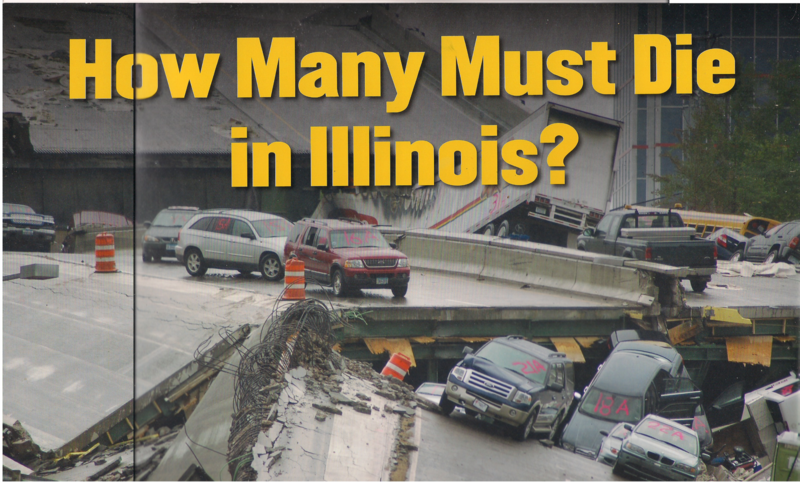 The actions of our state’s politicians could result in bridge collapses that could kill tens of people. After all, if it happened in Minnesota, it could certainly happen here in Illinois. To put it mildly, Illinoisans simply cannot afford the Rahm-Rauner-Hays corporate agenda, especially when it comes to transportation. Disgraced U.S. Rep. Aaron Schock (R-IL) has been implicated in one scandal after another in recent months, most notably the Decorgate scandal, in which Schock had his Washington, D.C. office decorated in a lavish, Downton Abbey-inspired style. Schock chartered an aircraft to take him from Manassas Regional Airport in Virginia, about 30 miles from the Capitol, to Peoria on Friday, Nov. 14. The return trip to Reagan National Airport was set for the next Monday. The side trip to Chicago was tucked in between, on Sunday, according to the pilot who flew the plane. Siilats told me in an interview on Sunday, “That whole weekend was paid by the government.” The only invoice Siilats said he submitted was for government payment. Siilats also told me he attended the Bears game with Schock. There are no records showing any reimbursement from Schock for the Chicago flights. That’s right…Aaron Schock is using your taxpayer money to fly to professional football games. I think it’s absolutely ridiculous that federal tax dollars, which could be better spent on things like rebuilding crumbling infrastructure, helping the poor, and so on, are being used for a Member of Congress’s trip to a NFL game. Aaron Schock should resign from Congress immediately…in fact, he should have resigned a long time ago. In the meantime, I’ll start referring to this latest Schock scandal as the “Bearsgate” scandal. Debt-ridden ITR Commission Co., a spawn of the Spanish-Australian company Cintra-Macquarie, filed for chapter 11 bankruptcy in U.S. Bankruptcy Court in Chicago in a prepackaged plan to restructure its approximate $6 billion debt. The company in 2006 paid $3.8 billion for a 75-year lease of the road that runs between the Illinois and Ohio state lines, but the toll revenue failed to meet company expectations. This is the main reason why I’m opposed to toll roads, especially ones that are leased to a private entity by the state in which they’re located. If the toll road doesn’t get enough traffic, then the company that owns the lease can’t pay the bills, and motorists and taxpayers get the shaft. We need to rebuild our nation’s infrastructure, not let it go bankrupt.